If you’ve ever entered as much as bing… into your search engine, you’ve surely been deluged with offers by bingo websites vying for your attention and ultimately registration with tantalizing promises for free cash, insane amounts of deposit match-ups, free bingo games, spin the wheel and what-not offers. Even an experienced bingo player whose dauber has been tested in many a game would be a bit perplexed, let alone a new player who has just taken up UK’s favourite gambling activity as a pastime. Now, we wish we could tell you that all you needed was our guide to the best bingo bonuses online but we’d be remiss not to mention all the subtleties and intricacies involved in such a choice. Finding the right bingo bonus will depend on some details, which we will discuss in the paragraphs to follow. 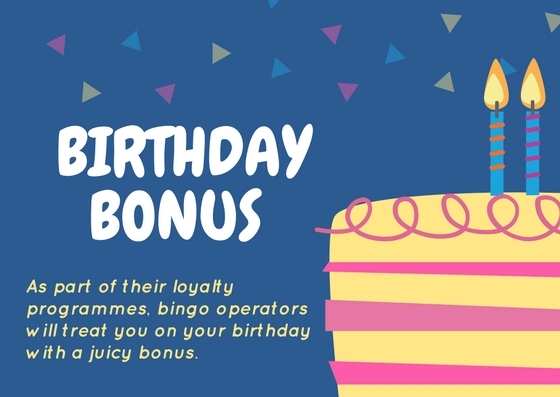 In order to help you make an informed decision, we’ll outline each aspect of claiming and using a bonus, as well as the different types of promotions you can benefit from at online bingo sites. The most widespread type of bonus you can come across at bingo sites is the welcome offer. Very few bingo sites will indulge in the luxury of not offering something special in order to attract new customers. Bonuses may vary in terms of amount and some conditions attached but in essence, it comes down to two main types of welcome bingo bonuses – a match-up for your deposit and a freebie that you get simply for registering, without the need to deposit anything. Sounds too good to be true? Well, kind of. When it comes to being offered free cash online, you should always take things with a healthy dose of scepticism so here’s what you need to know about welcome bonuses. You will be forgiven for raising an eyebrow at the idea of someone actually giving you free cash on the internet but no-deposit bingo is a thing. A thing with the whole gamut of bonus conditions and requirements but a thing nonetheless. For starters, you will need to register and provide some contact info so that you can claim a no-deposit offer and in order to cash out your bonus, you will need to have provided some financial details. Don’t get your hopes too high, as the sum of a no-deposit offer is, quite understandably, fairly small and very often there will be some limitations regarding which rooms you can play at using your bonus. There are wagering requirements attached to these types of bonuses as well, so make sure you read all the small print. Still, this remains a very nice opportunity to try some games and get a feel of the website before you spend any real cash, so if you’ve found an operator that offers it, it’s not a chance to miss. Almost all bingo operators will offer new players who register and deposit a match-up bonus. This has become standard practice so it’s really hard for operators to stand out with just a run-of-the-mill 100% match. But hey, that’s good news for you as a customer because you have all kinds of additional perks coming your way as part of the welcome offer. Not only do operators go as high as 400% matches, but some will also offer you free spins on slot games, or vouchers that you can use at their stores; others will lower the minimum sum of the qualifying deposit or give you the chance to wager the bonus on other games besides bingo. However, you need to take a closer look at what’s behind these benefits because all deposit match-up bonuses come with some conditions and requirements that you need to meet before you can claim any bonus funds and winnings made using them. There’s usually a limit on how big the bonus can be – if you take a closer look at the offers, you will see an “up to” somewhere in there which means that no matter how much you deposit, you won’t get a bigger bonus that this “up to” amount. For bingo operators, this is usually between £35 and £60. There are some operators who don’t cap their deposit bonuses which means that you will be able to get a higher sum (we’re talking three-digit numbers here) but taking the wagering requirements into consideration, you will have to wager much more or risk forfeiting your bonus and winnings. With no-deposit bonuses now on the verge of extinction due to new taxes imposed, bingo sites are veering towards free tickets and free spins. No complaints here. Lucky Pants Bingo give new players special bingo and slot bonuses, plus free spins, while Mecca is hosting one week of free bingo, and Wink are offering vouchers for their Wink Shop. Add to cart, please. So, choose wisely. If you’re willing to spend more but not at once, you could look for a website that will offer you a welcome package or a welcome bonus that is spread over the first three (sometimes up to five) first deposits you make. As mentioned, in addition to the limit of the bonus, there’s also a minimum deposit amount that will qualify you for the offer. Most bingo websites require that you deposit at least a £10 but you will also be able to find some that lower the threshold to £5. Discussing bingo bonuses can paint a very pretty picture, as they are quite generous and appealing but we need to discuss the big elephant in the room – the wagering requirements. Every bonus, especially the deposit match-up offers come with a set of requirements for a rollover, validity and minimum deposit & maximum amount. The rollover means that you will have to wager the bonus amount or the deposit or deposit + bonus a certain number of times before you can claim your bonus and winnings you’ve made using the funds. Let’s take a look at an example with a 3x rollover requirement. 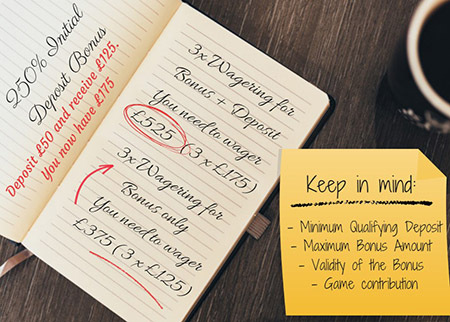 If you deposit £50 and get a 250% match-up of £125 bingo deposit bonus, you would have to wager £375 (3x £125) before you can cash out. Some sites include the cash deposit as well so that would mean £525 (3x £175). Another perk for newly registered players is the option to play bingo for free in the so called Newbie or Learners Rooms. Usually, you can get somewhere between three and ten days during which you get to play without spending money but with the possibility of winning real cash. These free bingo rooms are an ideal option for players who are yet to get to grips with the rules of the different bingo games. Typically, those would be the standard 90-ball or 75-ball bingo variants, so nothing too complicated or overwhelming. Just classic bingo gameplay to let you practice without the risk of losing your hard-earned cash. In addition, the biggest operators in the industry also offer blogs and schools where you can find articles explaining the rules of the game, glossaries of the terms (some chat room hosts use the bingo lingo when announcing the numbers) and more useful information about the basics of playing online bingo. With all this pampering for new players, you may think that you’d be left to your own devices after you’ve claimed your welcome treats but that’s hardly the case. It is true that bingo sites will dote on their newly signed up members but they don’t forget to treat their returning and loyal customers as well. One of the most beneficial offers are the reload or redeposit bonuses. Their principle is pretty much the same as that of the first deposit bonuses but usually the match-up percentage is a lot smaller. However, they do have wagering requirements and minimum qualifying deposit sums, the way first deposit bonuses do. There may be restrictions as to the games on which you can spend the bonus funds, as well. Reload bonuses can be a one-time offer or they could be available only with promo codes that you need to use every time. Make sure you know where to get these codes – will they be sent to you by email or a text message? Are they readily available on the website? Check your inbox, the Promotions page on the operator’s website and their social media, so that you never miss a chance to get some extra cash. As you can see, it’s a good idea to read the terms and conditions very carefully before committing. Every site has a very different policy, and by law have to explain this policy. Sometimes it is buried a bit but it has to be there. If you can’t find the terms and conditions, contact the site before you deposit any money. Usually, bonuses have validity – somewhere between a week and 90 days – which means that you will need to meet the wagering requirements in that period of time or risk forfeiting the bonus. Since one network will have many websites, you will notice a tendency for the bonus promos to be somewhat of cookie-cutter offers. While a bingo network may implement a strategy to equalize its promotions across all its websites, they may also decide that some sites are more equal than others and make one of its flagship titles stand out with a bigger and more appealing welcome treat. Don’t be quick to despair over the lack of diversity because usually, bingo networks will allow you to claim only one bonus at one of their websites with the same credentials – email and IP address. So, if you find one of those unicorns in the world of online bingo – a standalone site with a tantalizing welcome treat, you might want to bag it while you can. Still, playing at bingo websites which are part of a large network has its perks that will make up for the single bonus system. At sites like Red Bus Bingo and Tasty Bingo operated by larger networks like Cassava, you can scoop higher jackpots as they are pooled from all outlets of the network – the more players, the bigger the jackpot! In addition, you will also be enrolled in a loyalty scheme that encompasses all websites which means that you can get invited to exclusive rooms and get more perks using your VIP status even at websites you’ve never registered with. Half of the registered online bingo players say that they log in to play at least one game a day and when you look at the abundance of ongoing deals and special treats, you can easily see why. Bingo sites will shower you with different promotions every single day. Whenever you decide to log in, you are bound to find at least one not-to-miss promotion that you can join. Throughout the week, you can enter chat games, get a share of guaranteed jackpots, or get a percentage of your losses back with cashback promotions. 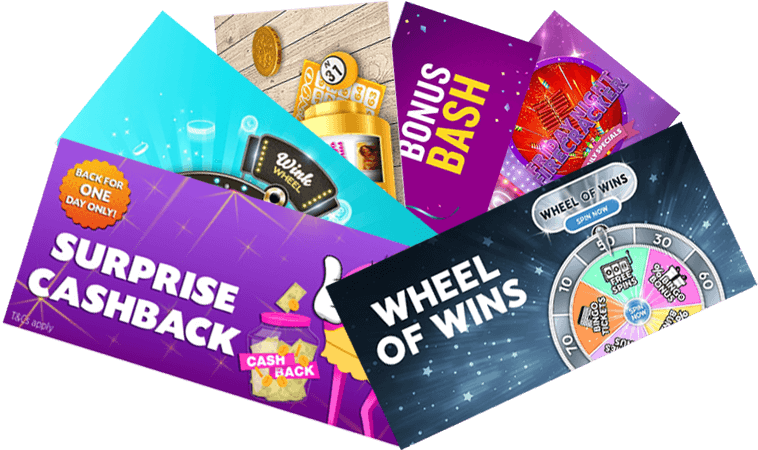 Some sites will treat you every single day when you log in with a freebie, which is usually just “Spin the Wheel” but all of its sectors have rewards like cash prizes or free tickets, free spins and bets. You can also be treated to fixed cash prizes like a quid for your daily login. Add some excitement to a drab Monday with extra action at Bucky Bingo. Spend £10 on bingo and you will get a £5 bingo side games. Pre-buy tickets or join the Broadway room at Butlers Bingo from 9pm for a chance to win £1,000. Best part – the promotion is actually running every single day. Enjoy hourly spins of up to £150 and mini-games with The Winning Wheel at Mecca Bingo. Join from 7am – 8am, 3pm – 4pm, 6pm – 8pm in the Two Little Ducks, Meccarena, Key to The Door or Legs Eleven rooms. Take a break from the hustle and bustle and try your luck for £2k in guaranteed prize money at Betfred bingo from 8am-9am. End the working week on a high note with a £20,000 jackpot. Join bet365’s A Night on the Town room from 18:00 – 23:59 on Friday and get some sweet cash to kick off the weekend in style. Sit back and relax on a Saturday with Give Back bingo’s easy-breezy £500 Saturday Special that gives prizes for full house, 2-line and 1-line wins. If you’re not playing bingo on a Sunday, what are you even doing with your life? The day of bingo can surely be generous with a cut of Blighty Bingo’s £10,000 jackpot. Daily promotions are the reason players stay loyal, so most bingo sites will have a special offer for every day of the week in the form of jackpots, cashbacks, and free spins. Butlers Bingo run their JPGot2Go at the Broadway room where £1,000 are up for grabs every day of the week, so you really can’t miss out on that one. And if you’d like to look up what other offers are available, check out this list of the best daily deals that will keep your bingo calendar busy. As you come back to the website, you will notice banners for other promotions pop up – these can be daily, weekly, monthly and seasonal. There are of course the “Buy 1 Get 1 Free” deals, 1p tickets, and the 1TG and 2TG which may not look like bonuses in their own right but are still a way of boosting your chances of winning more and bigger prizes. In addition to all of these bingo bonuses, players can also get special offers for the other games offered at the website like slots, scratch cards, and casino games. You may get a combined bonus like a match-up deposit bonus plus a number of free spins to play on bingo slots, or you may claim a bonus that has to be wagered on instant games only. Cashbacks or getting back a percentage of your losses on slots and casino games are also a popular offer. Bingo sites are all about socializing and making friends – according to a study, 47% of users who play bingo online have managed to form a new circle of friends – and if you want to invite more of yours to join in the fun, you will also be rewarded. “Refer A Friend” bonuses can get you pure cash as long as your friend makes a deposit and meets the wagering requirements. Usually, there will be a little something extra for them, as well. Plus, you get to hang out and share the excitement together. Now, that’s a win-win and an extra win! Many see this idea as the best bingo bonus. A guaranteed jackpot game has a pre-determined prize pool regardless of how many players buy tickets. Great if only a few people play, but it can work in the favour of the site if a lot more tickets are sold. The no-lose promotions come in a few guises. The community jackpot is a game that splits the prize pool giving the majority to the winner, and spreading the rest among the losers usually on a per ticket basis. A typical scenario is for example a prize pool of £3,000. Three players have tickets, player one bought 25 tickets and won the jackpot, player two bought 50 tickets and didn’t win, player three bought 100 tickets and didn’t win. Player three gets twice as much as player two from the losers share, because he had twice as many tickets. Very often though there are so many players in these types of games that the return on each ticket for losers is a fraction of the purchase price, which is more than likely to be paid in bingo bonus. The Dragonfish network runs two games per month with this format. Another variation is run by the Virtue Fusion network, where losers get a ticket for another game or scratchcard. Now that we’ve mentioned VIP programmes, let’s shed some light on how comp points and loyalty schemes work. With most operators, as soon as you sign up, you start accumulating loyalty or comp points. You get these for every bingo ticket you buy or a wager you make, and usually the number of points you get depends on the price of the ticket or the amount of the bet. It can also vary depending on which games you’re playing – you may get fewer points for placing a bet on slots or other casino games. The points you’ve accrued can later be exchanged for real cash that you can use to play bingo or instant games, or you could spend them on merchandise at the bingo’s shop, provided they have one. It is often the case with many operators that with the accumulation of more points, you also climb the levels of the site’s loyalty scheme or VIP programmes. They usually have multiple tiers that you get access to on a simple “more points – higher level” principle. 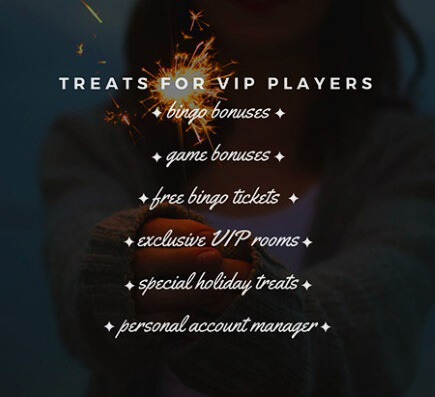 Like we discussed above, some big bingo networks will make a VIP scheme for all their websites and users will be able to enjoy the special perks at all sites included. These treats can be anything from better conversion rates for comp points, birthday gifts, invitations to exclusive rooms, a personal account manager, and even trips to popular destinations across the world or rewards like laptops and even cars. As you can see, being loyal pays off.